Competitive games between Myrtleford, Bright, Harrietville and Wandiligong began in 1888 in the Myrtleford-Bright Football Association. Later, teams from Ovens, Gapsted, Whorouly, Buffalo River and Mudgegonga would be involved. Crowds attended Myrtleford home games at Memorial Park, which by 1939 was considered too poorly drained. However, it was not until 1954 that the football club shifted to its own ground in Lewis Avenue. The late 1930s saw the Myrtleford Wanderers win three successive premierships and then again in 1945. The Myrtleford Tigers were then very successful in the 1946-48 period. In 1949, Myrtleford joined the Ovens & Murray Football League, waiting until 1970 to win a premiership. A Myrtleford Town Brass Band existed in the 1880s, but involvement varied from decade to decade. The 1950s and 60s saw a resurgence in interest, but the band had disbanded by the end of the decade. Croquet thrived in the post-war period, as evidenced by this photograph. The club disbanded in the 1980s. Cricket had established itself by the 1890s, with a ground located in the vicinity of where the Memorial Hall and Supper Rooms stand today. The oval at Gapsted was located at today’s site. Myrtleford games, having once used the Showgrounds Recreation Reserve and Memorial Park, now centre on the Park and the turf wicket at the football ground. All local district teams have had outstanding cricketers, the most noteworthy being Tom Patton and Norman Rippon of Buffalo River, who in the 1913-14 season grand final against Whorouly at Gapsted, set a world record for an A-Grade third wicket partnership of 641 runs. This record stood until 1988. 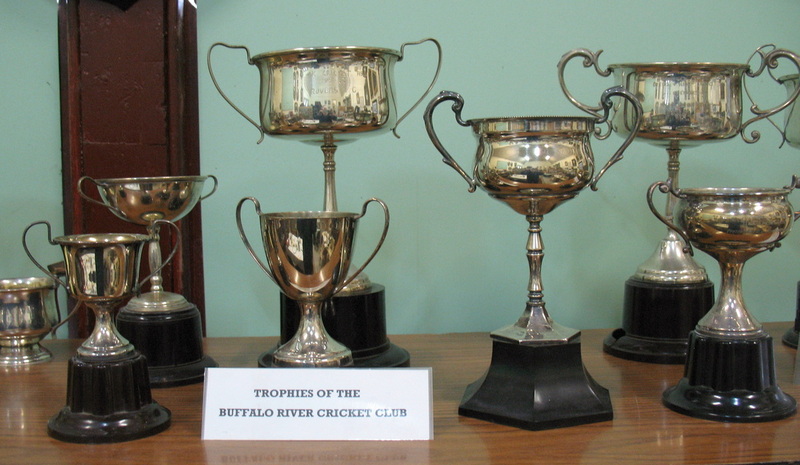 Trophies of the Buffalo River and Myrtleford Rovers Cricket Clubs. 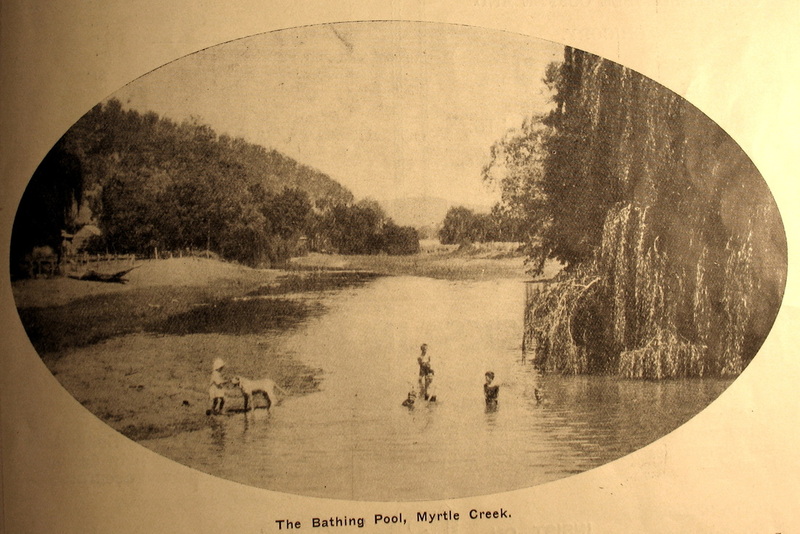 Myrtleford’s first public pool was in the Happy Valley Creek, but successive pools have been located at today’s pool site since 1930. These pools were constructed with the assistance of state and shire funding and later, service club funds. The 1966 pool was officially named the A.D. Lowerson VC memorial Swimming Pool to honour Myrtleford’s Victoria Cross winner. Swimming in the Myrtle Creek. Rifle shooting developed in the town across the treeless southern slopes of Reform Hill after the closure of the Reform Mine late in the 19th century. A rifle club was officially formed in 1904, and shooting long range using .303 rifles was popular with ex-military and local farmers. A small bore shooting range was also developed on site in the 1950s shooting over 25 yards. Increasing vegetation and the noise factor forced the club to relocate to Whorouly East to the Phillips property in the 1960s for long range shooting up to 900 yards. Both the Myrtleford and Whorouly East ranges officially closed in the 1990s. A rifle shooting club also existed at Buffalo River from the end of World War 1 and was located in the river valley just above the Lake Buffalo Dam wall, shooters firing in an easterly direction over a long range. Les & Bill Mitchell at the Whorouly east Rifle Range. Myrtleford longed for bowls well before the Second World War, but the rinks were not opened until 1948. By 1954 there were eight rinks with a modern clubhouse and by 1959 a second set of rinks was required. Golf began in the early 20th century on land near the Catholic presbytery and adjacent to the Pioneer Cemetery in what were called the “accommodation paddocks” (for resting livestock). After laying out the course at the Showgrounds-Recreation Reserve and racecourse in 1928, a new facility was officially opened in 1933, with sand scrapes which have evolved into some of the finest grass greens in the state. Tennis has always been a popular sport: by 1900, sixty members were playing in a local competition. Courts were located near the corner of Clyde and Standish Streets and at the western end of memorial Park. Each of the four churches in town developed their own teams and established courts, as did outlying settlements such as Mudgegonga, Eurobin, Buffalo River. In 1938, work began on the first six grass courts in the public park adjacent to the new swimming pool, with three more added in 1946. Within three years an annual Easter Tournament had begun, which remains a fixture on the town’s sporting calendar today. Horses were racing on the western edge of the town by the mid-1860s, on a track which started and finished at the corner of Standish and Myrtle Streets; another was on the Merriang side of Round Hill. Crown land was then allocated in 1866 where the Showgrounds-Recreation Reserve and golf course are located today. The racing club continued to operate until the 1950s, its last affiliation being with the Yackandandah Picnic Racing Association. Myrtleford has held an Annual Rodeo (the Golden Spurs Rodeo) event since the late 1950s. It originally was held at the Myrtleford Football Ground under the auspices of the RSL. In later years, the Myrtleford Lions Club joined the RSL to conduct this annual event on Boxing Day each year at the Myrtleford Showgrounds.